Imperforate, no watermark, no gum, typographed. 1928. #1 with a yellowish wash applied. More questions than answers surround the first issue of Yemen. The stamps were printed on unwatermarked paper, but are found with watermarks. The paper was laid, but wove paper is also found. Scott #2 is imperforate, but is also found with 'perce en point' 10, and sewing machine perforation of 15 to 18. The latter is probably a private perforation, possibly applied by a local tailor! Not even the denomination of the stamps is widely agree upon! Most believe that Scott #3 has the value 1/8 imadi, equal to 5 bogaches. However, for Scott #1 the story is quite different. Some argue that that the inscription in the left dagger blade, where the denomination is placed on all the stamps, reads ½ imadi, making it the high value of the issue. Others believe the inscription reads "1/2 of 1/8 imadi" or 1/16 imadi, making it the low value of the issue. A compelling argument for the last opinion is that the yearly subscription price of a monthly newsletter, costing 1/8 imadi per issue, was 2¼ imadis. Since it was franked with a Scott #1, that would suggest a denomination of 1/16 imadi, since 12 * 1/8 + 12 * 1/16 = 2¼. One big question I have is the inscription at the top of the stamps. It is supposed to read "Sana'a", the capital of Yemen. But to my eye the inscription is not the same on Scott #1 and #3. Scott #2 is actually a Scott #1 with a yellowish wash applied, sometimes before, sometimes after the sheet was perforated. The color range from pale mustard to bright orange. At least four different kinds of paper was used for the first issues. Horizontally and verticall laid paper with perpendicular wire lines, paper turned 90 degrees and softer, thicker wove paper. There's plenty of room for study in these stamps. Watermarks have so far only been found on a small percentage of laid paper copies. Three different watermarks have been identified, but one or two more may exist. Too few reports are available to say for sure. No watermarks have been discovered on wove paper copies. The sheets consist of four rows of five stamps each, making for a full sheet of 20 stamps. The print quality was, at best, poor. Numerous missing details in the design, and ink spots here and there can be attributed to over and under inking of the clichés. Several different cancellations are found on these stamps. The earliest were circular, hand made devices, about 20 to 24 mm across. These were used on the first two stamps issued. Around 1928 larger and better cancel devices came in use, about 28 to 31 mm in diameter. About 50% of all cancellations are with this latter cancel device used in Sana'a. This links to an image of a full sheet of, in the original webmaster's opinion, Scott #3. Much of the information here came from an article by Alexander J. McDonald named "The Yemen Jambiya issues". Mr. McDonald is a member of OPAL, or Oriental Philatelic Association of London . The site appears to be a bit dated, but the contact info may still be good. Floyd A. Walker (see Syria) writes, "YEMEN ARAB REPUBLIC is the final entry in our [alphabetical] Middle East list. The first stamp for Yemen was issued in 1926, but Yemen now includes Aden and the various Aden states plus the Yemen People's Democratic Republic and the Federation of South Arabia." Yemen was described in detail in articles by Tim Balm (FICC#91) in Journal v9n1p1 [2000, 1] and v14n4p4 (2006) and summarised here. Yemen, now Republic of Yemen, is a small country located in the southwest part of the Arabian Peninsula in the Middle East with the Red Sea to the west. 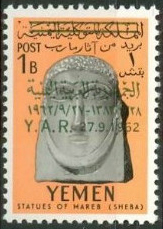 Yemen's history is turbulent wth many stamp-issuing entities in the 1900s, each of which could be considered to have its own First Issue. The summary table has been adapted to include Gibbons data and while the original table numbers only the first set (e.g. Sc1-3), this table shows the whole number range for each entity (e.g. Sc1-143). The northern portion of Yemen gained independence from Turkish rule in 1918 as an aftermath of WW1. This area then became the Yemen Arab Republic on 27 Oct 1962. At about the same time (1963), Aden and several sheikdoms, emirates and protectorates in the southem portion combined to form the Federation of South Arabia under British rule. When the Federation became independent from Great Britain (30 Nov 1967), the People's Republic of Southern Yemen was formed. 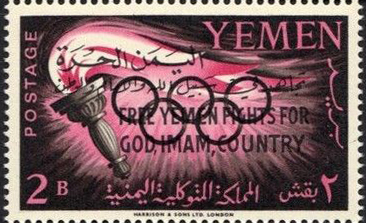 This southern area changed its name to the People's Democratic Republic of Yemen on 30 Nov 1970. The 30-month process of unifying the YAR and the PDR into the Republic of Yemen began in 1990. † The List column shows where the entity is listed in the catalogues, Scott (and Gibbons in brackets where it differs). The abbreviations are A(den), SA (South Arabia), Y(emen), PDRY (People's Democratic Republic of Yemen). ‡ Gibbons begins a little earlier than Scott with unified Yemen, SG1 is Sc512. 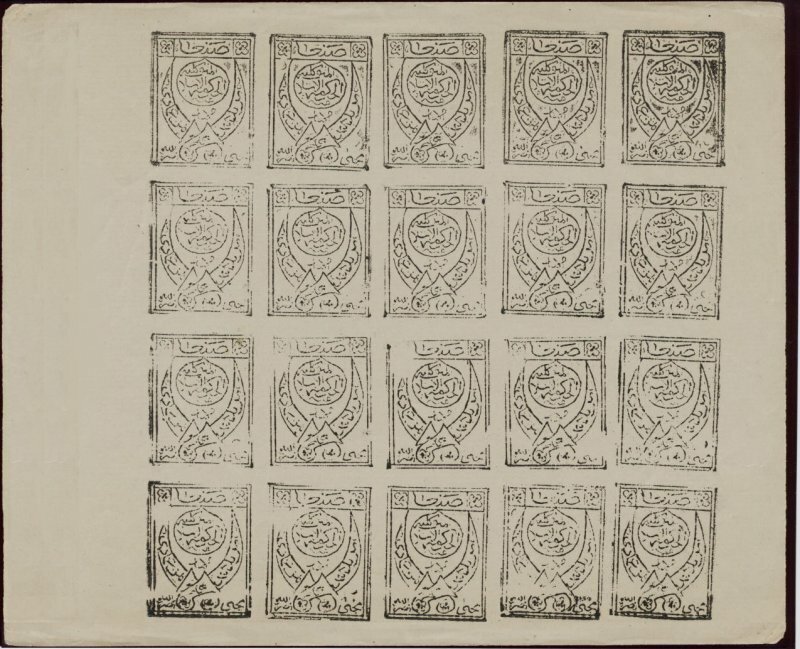 Images for the stamps of the various entities are spread over Aden, South Arabia and this page, the split broadly corresponding to the List column in the table. Sources: ScS, SGP17 , Journal v9n1p1 and v14n4p4.